Jordan was in town again today but had to work on rebuilding the engine in the seine skiff. I had a few things to get caught up on as well, like applying a fresh coat of Rain X to the windows and finding and stopping the leak in the hatch over the V-berth. I didn’t think these tasks would take too long and spent the morning bumming around the boat, showering, and cleaning up the boat a bit. Nothing too exciting. The weather was nice, a bit cloudy but there were some sunbreaks and it was actually fairly warm. I got to talking with the guy next to me, Gary, in a 33 foot sailboat. He works as a delivery captain, moving other people’s boats all around the west coast. This trip, however, he was on his own boat, which he had sailed up from Everett, WA. He’s old school…no chartplotter, no radar, no AIS or other electronic aids to navigation. He has a 20+ year old handheld GPS, compass, depth sounder, and paper charts. And he seems to be getting along just fine. As it turns out he ended up liking Petersburg so much that he’s decided to stay. And not just for the summer. He leased a slip for a year and will be living aboard. I got his email address, so I’ll have to see how he likes it after the winter. In the afternoon I went to the hardware store and picked up some Rain X and sealant for the projects I needed to finish. They also had an anti-fog Rain X product for interior windows that I bought. The windows in the boat, especially with extra people onboard or during periods of heavy rain, tend to fog up and I’m hoping this product will alleviate that somewhat. The interior and exterior Rain X application was easy, if a little tedious. Wipe on, wipe off. I had put some silicone sealant on the area which I thought was causing the leak in the forward hatch the same day it appeared, and I hadn’t noticed any leaking since. So I took the dock hose and attacked the hatch from all angles with high-pressure water for 10 minutes or so. No leaks. So I’m hopeful that the problem is indeed with the hatch itself and not the bedding. I removed the silicone (it was a sloppy job) and put some new sealant on which hopefully will adhere better to aluminum and will prevent leaks in the future. Then I rinsed down the whole outside of the boat to remove dirt and salt spray that had accumulated. Sometimes it’s nice just to have a day to catch up on chores that need to get done. Jordan finished about the same time as I did and we grabbed pizza from a place near the top of the dock, which was actually pretty good. Then a friend called him and said they were having a bon fire up a forest service road a few miles out of town. 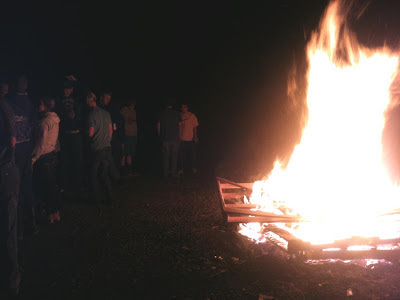 After a quick trip to the liquor store we headed up to a massive fire in an abandoned quarry. Wooden shipping pallets make good firewood! Most of the people there seemed to be in there 20’s, almost entirely from the local seine fleet. It’s fun to have different experiences up here. I’ve met people ranging from CEO’s to wood carvers and deck hands. They’ve all got interesting stories to tell, and almost without fail they’re welcoming and friendly. Massive bon fire...look at the people in comparison!